Anmerkungen Ein früher geplanter Name des Spiels war Aladdin. Take a tip from a Genie: New Arabian from ATARI will materialize profits before your very eyes! 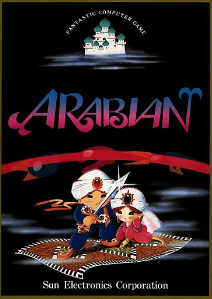 ATARI sends players on a magical journey into the land of 1001 nights when they play ARABIAN. The game play brings to life the tale of a young Arabian prince who must rescue his princess from a castle tower where she is being held prisoner. Evil genies in brass jugs, swooping Roc birds, and purple ghostlike creatures called Oscars threaten the Arabian on each page of the story.